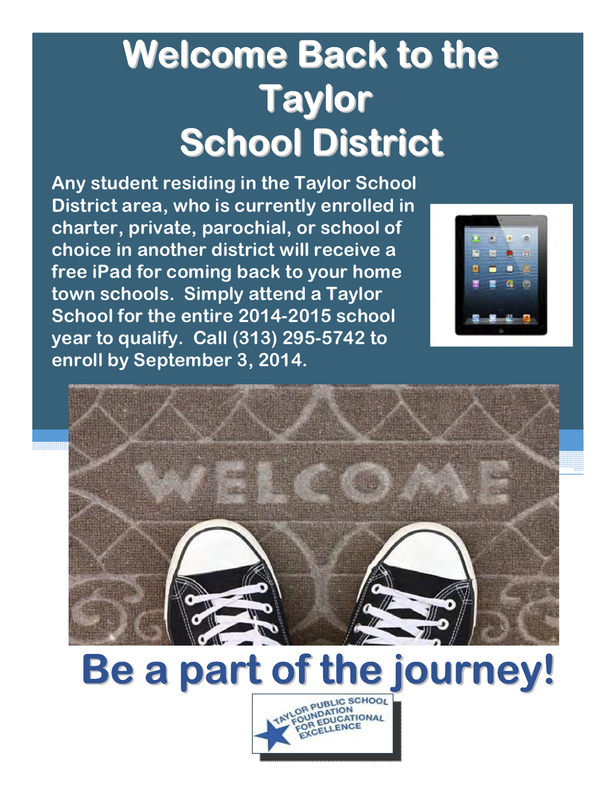 ENROLL IN TAYLOR SCHOOLS and get a new iPad! If you reside in the Taylor School District boundaries but attend another school (parochial, charter, etc. ), here's a way to get a new iPad! Enroll in the TSD by Sept. 3, 2014 ... and you're in! The Taylor School District is offering free preschool! Families who reside in The Taylor School District attendance area and have a child who is or will be 4 years old by December 1, 2014 should call 313-295-8362 to set up an appointment. The program offers certified teachers, reading readiness, learning through play, field trips, music and movement, writing, math exploration, art and creativity. The City of Taylor has scheduled a FREE special trash pickup for flood-related items on Saturday, August 16, Mayor Rick Sollars announced Tuesday afternoon. This is for flood-related trash only. Residents interested in this special pick-up MUST register through the City Hall Customer Service Center by noon on Friday. Only residents who register before noon on Friday, August 15, will be able to participate in this pick up. Residents who encountered flooding problems should register by calling (734) 287-6550, or they can register in person at the Customer Service desk in City Hall. So far, the City has received between 50 and 100 calls from residents whose homes were hit by flooding on Monday, August 11. Midwest Sanitation will begin its special pick-ups at 8 a.m. and will likely be done by noon. Residents should have their items placed at the curb by that time, if not before. All pick-ups will be assigned based on the registered calls and walk-ins to City Hall only. Executive Robert Ficano has declared a state of emergency in Wayne County due to the unusually heavy rainfall. Tonight's scheduled "Park It!" free family fun night at Heritage Park has been postponed.